We've been furry busy the last few days. 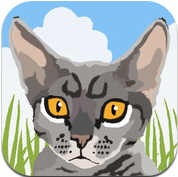 First, our pal Nellie sent us an email about some pawsome cat iPad games made by Friskies. And then we found another one called Cat Toy by tnxbai that has a mouse with a real squeak in it! I am furry clever so I Looked but I wasn't Fooled by the Fake Fish. Au was though! He fished for the fish. And so was Target! He fished for fish AND looked under the iPad to see if he could get them there. Also, there is Bad News. We cats were Abandoned again this weekend. From Friday afternoon until Sunday afternoon we only had our friend Umi visiting three times a day and our friend Malo coming in on Saturday morning to Make The Bed with me. Au moaned about de survunts being bad, and Target whined about missing his Mummy Cat at night. This got me thinking: it's time we had some Discipline. Clearly being tough like Au doesn't and sweet like Target doesn't work. I shall therefore Institute My Own Programme of Obedience for Cat Pets. Training starts today! Watch this space..... Oh and please Like us on Facebook too. You are so lucky to have your own iPad! Wow. We have our paws poised to take note on your programme...as you know our Mommy is SO unreliable. I don't like any of those iPad games. You can toss them in the air and catch them. I does not has an iPad, but efun if I did I don't fink I would play that game because nuffing on the computer or TV screen efur innerested me. I dunno though--maybe I should make the Human get me one just to check it out? Also, I was supposed to be 'bandoned yesterday from 9 a.m. till about 4 p.m., BUT the Human didn't get home till after MIDNIGHT. It wasn't 'zacklee her fault (see our bloggy today) but still! I might have STARVED!!! Ipad games can be pretty addictive. you'll end up playing for hours. You kitties are so lucky to have an IPad. That looks like so much fun. Looking under the device is a good idea. Have a great week. Oh what cute pictures of you fishing the fish! I found the same game and my boys played a little bit. I think I am the one who play with it more, though. I'm sorry you were abondoned...I hope the training will work! Those fish look fun to us! Our human doesn't have an iPad, though, so we'll have to look from afar. And what, your Umi came in only 3 times a day???? Malo on Saturday? What terrible treatment while your humans were away! I shall have to sniff those out and see what is whapping! So cool you have an iPad! Looks like fun. Hope the training works! I love the cat toy. It looks like Au and Target enjoyed. Au looked like he was having fun trying to figure it out. That ipad looks great and the screen is just the right size for us kitties we have dropped lots of hints but we think our Mum has selective hearing! Getting your iPad and app for playing that is so cool. Guido do tell about the new training as it is always good to try new things to get the Mom to listen. You are so lucky to have Ipaw to play with!! We don't have one, but thanks for paws up about the games. We will try to talk our Mom into getting one for us! Yup, if you can't get those fishies any other way, stomping is worth a try. Our mom says she's getting one of those iPad thingeys. When she does, we're gonna steal it from her so we can play with it! OH WOW! A game with a squeaky mouse! Me is going to go gets that game right NOW! Thanks guys! Hey Boys, What did you fink about that new Microsoft tablet that was unveiled today? My Human is soooo lame and low tech. I'm surprised we even have a computer! Looks like lots of fun! I think I might even like to play with that! Sorry, you were abandoned ...silly humans! Wow - we gotta get our humans up witht he state of the art cat toys!!! Come back by for more Chica stories! The food is never fast enough. Or the petting furious enough for our kitties. Not any day. Even when the humans aren't at play. thanks for stopping in to check on me. I have some good pictures this week the kitties might like! hugs & scritches! Wow, u guys are such high tech kitties! iPads for cats! What next?! Hee hee...dat is funny what it says...get de fish! You are so lucky you have Ipad! Our mommy needs to get us one! So sorry you were abandoned for a while again!